And if there is any master tables you can write code to insert after database creation, like this. This approach is not feasible if you have lot of data, for example a Dictionary database. In such scenarios you can add the existing database to the project, and setting the Build Action to Content. 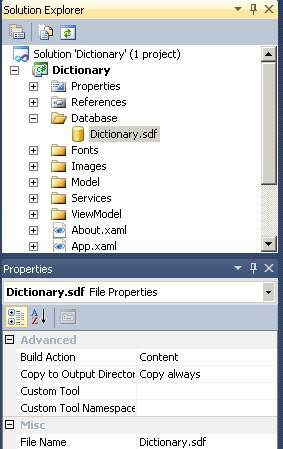 This will deploy the database file with your application onto the phone, but it will be placed in the same folder as all other static content for your application. Your application can only read from this folder. You can communicate to existing database using following connection string. If you want to modify the database, you need to copy (duplicate) the database to the application isolated storage. Here is the code snippet which will help you to copy your database file to isolated storage.